Aspire is a short stroll from the café, retail outlet and recreational facilities at Evanston Park’s STARplex, and with Gawler only five minutes down the road you’ll also be able to enjoy Gawler’s famous main street with all of its supermarkets, banks, entertainment facilities and bakeries. Aspire with the Barossa Valley right on your doorstep, and the Adelaide CBD only thirty five minutes away via the Northern Expressway. Aspire to be connected. Aspire at Evanston South is NBN (National Broadband Network) compatible, bringing high speed broadband and telephone services to each home. The NBN connection makes working from home easier, enhances children’s learning and offers you a broad range of entertainment choices including internet connected video-on-demand services and high quality video calling. We’ve also made Mains Gas available to be connected directly to each home to make heating, cooking and hot water easy and convenient. Also, at Aspire there is no need for a septic tank – each home is connected to the mains sewer. This minimises both maintenance and building costs associated with septic tanks, and gives you more freedom when siting your home and planning your garden. Located in a premium pocket of Gawler on the eastern side of Main North Road, Aspire is within walking distance to one of the northern suburbs’ leading schools. Situated alongside Trinity College, our new master-planned community Aspire is positioned in one of the most sought after locations in the north. Located around 40km north of Adelaide, Gawler is a vibrant town of over 20,000 residents that combines the charm of country living and heritage architecture with modern amenities and convenient access to large city facilities. 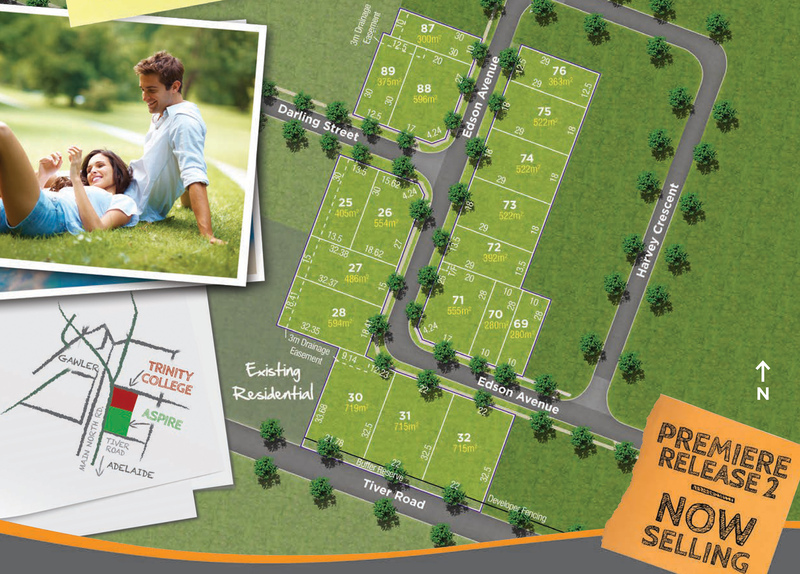 New Land Release at Aspire – big blocks!